Silberman explores the history of autism by weaving stories / case histories of autistic people in with stories of psychological and ideological leaps in the understanding of autism. He reveals a lot of details I didn’t know about researchers like Hans Asperger and the making of the movie Rainman. It was information that I was intrigued by, though I found his writing style to be a bit winding at times. In the end, I felt a little lost about what the thesis of Silberman’s book was – or if he had one at all. 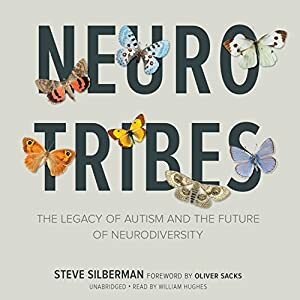 Before reading the book I expected to get a history of autism research with a lot of current information on the neurodiversity movement. But because there were so many stories of autistic people woven into the book, I didn’t really get what I expected. The information seemed a bit scattered. Not that I didn’t enjoy the book – I did. It was interesting reading about all those case histories – it gave the book a personal air. I just expected a more A-to-B-to-C historical account of the history of autism and the neurodiversity movement. I read Neurotribes last year and felt much the same way. I decided that it was a history of autism and important, but not quite linear in its presentation. I keep hearing about this one…sounds overly dense. I am intrigued by the topic, but probably not enough to power through something like that. This subject is so important. It is also so interesting. I think that combining science and personal stories is a good idea.Too bad that the book was a bit disjointed though. Yeah, I thought maybe I would have followed it better if it weren't an audiobook and I had subtitles or something. I read the audiobook. I sort of wished I'd read the hard copy because of the non-linear structure. But I'd say if audio helps you out (it does me) then go for it. It was still a really good book. I just had overly high expectations, I guess. I became interested in this book when I saw so many reading it for the read-along in November. As someone who is a newer fan of nonfiction, I am a little intimidated by the thought of reading it, but I have decided to give it a try, maybe in 2017. The subject is certainly of interest to me. It's definitely worth a try! The book covers a very interesting and important subject matter. And most people just absolutely love this book. I'm excited to hear your thoughts on this one! It was bit winding, but I think that's part of why I enjoyed it. I really enjoyed all the people stories. I finished reading feeling like the author had made a clear point though and I'm sure I'd have been more annoyed by the digressions if I felt differently about how clear he was. Yeah, it's possible I just wasn't in the right mood? I was listening to it on audio, which I'm having a lot of trouble with lately for some reason. Attention issues. Maybe if I'd read it physically it would have been different.